I’ve been seeing these egg bites frequent the internet quite a lot lately. 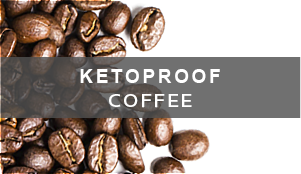 They’re delicious, they’re portable, and they’re now keto friendly! 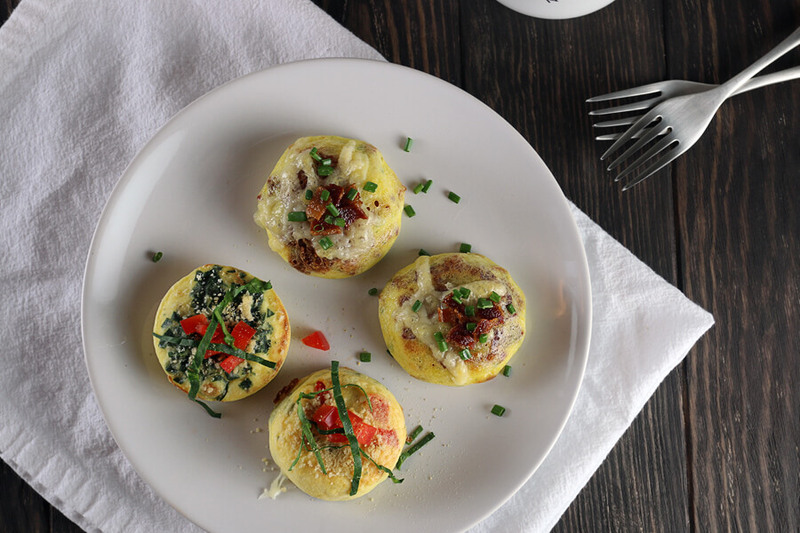 That’s right, these little breakfast morsels are inspired by Starbucks’ Sous Vide Egg Bites. The biggest problem I had with the original recipe is that you need a sous vide machine. While they’re an amazing piece of equipment to have around the house – most people don’t. And, they’re over $130 for a decent one! Plus, the original recipe takes over an hour to make. I’m definitely not a morning person, so I don’t have time to deal with that. 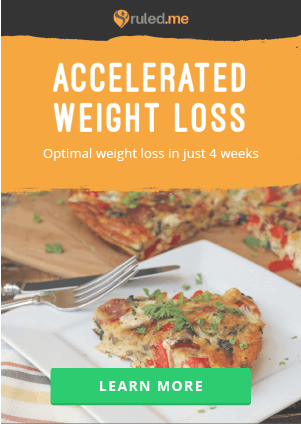 Being a huge fan of steamed eggs (seriously, you have to try this out) and frittata muffins, these really intrigued me. I thought it’d be a great idea to make the egg bites in my poaching pan – combining the velvet texture of steamed egg with the convenience of having something quick to grab-and-go with. These things are seriously fantastic. What I like best about them is the fact that you can make them ahead. Just cook them for slightly less time so that they’re still a little under-cooked in the middle. Save and store them for any time in the next few days in the fridge. When you’re ready to make them, just top them with your favorite toppings and throw them under the broiler for a few minutes. If we’re having people over for brunch, I’ll normally make 16-24 at a time. 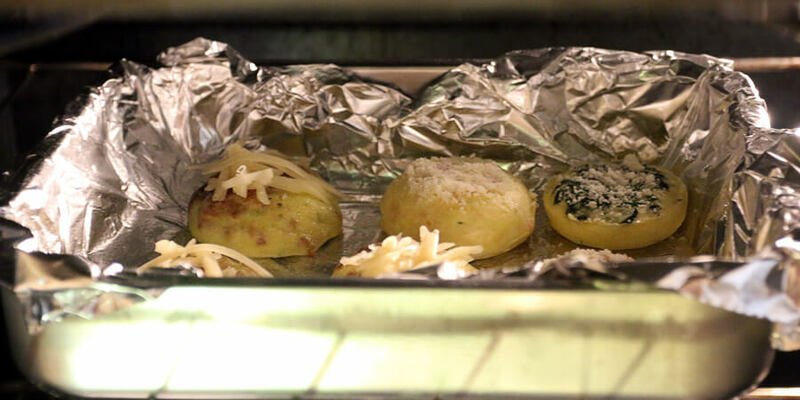 I’ll place each egg bite on a baking sheet (with some foil or parchment paper) and top them. Leave them in the fridge overnight, and then all I have to do is pop them in the oven the next morning. Salt, pepper, and additional seasonings to taste. These are by far my favorite to make. You can switch it up and add herbs or spices of your choice, giving a different flavor each time. 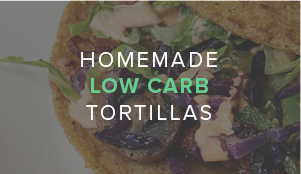 You could additionally add in new flavors (think pizza flavor, or chicken and avocado) to keep the variety coming. For me, the bacon was the hardest to get similar to the real thing. You can cook your bacon soft so that it’s easier to mold into the poaching pan. 1. If you’re making bacon, go ahead and put that in the oven now. I prefer to cook it in the oven since it gives a better texture in the egg bites once they’re finished. 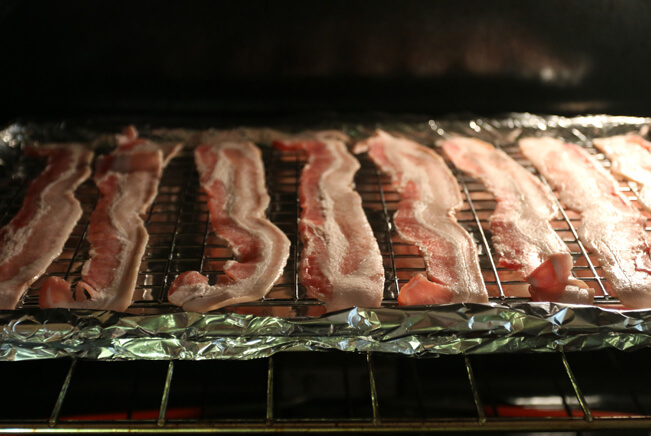 I do my bacon at 400F for 25-30 minutes, depending on how much I’m doing at once. Note: You can completely skip this step by purchasing pre-cooked bacon. It’s normally the type that is sold as microwavable bacon. If you’re in a rush or just want a fast breakfast, I highly recommend grabbing a bag! 2. Crack 6 eggs into a container, then add ¼cup cottage cheese to your eggs. Make sure this is full fat cottage cheese (preferably an organic source). 3. Chop the chives into small pieces. 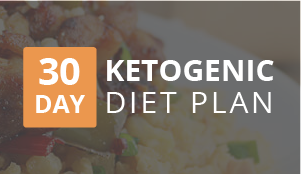 You want about 2 tablespoons in total. 4. 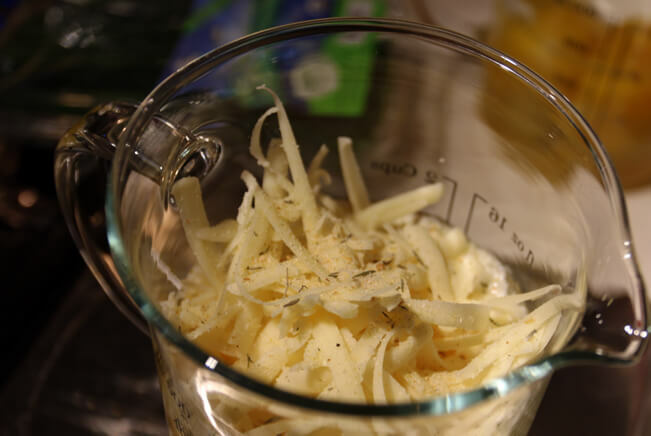 Grate the Gruyere and Monterey Jack cheese and then add into the mixture. At this stage add salt, pepper, and your favorite seasonings. I tend to keep it light with the seasoning (a bit of garlic powder and herbs). 5. Lastly, add the chives, hot sauce and butter into the mixture. Blend until smooth. I choose to use an immersion blender for this, but you can use a blender. 6. Add water to the bottom of your poaching pan. Then, turn to medium-high heat. 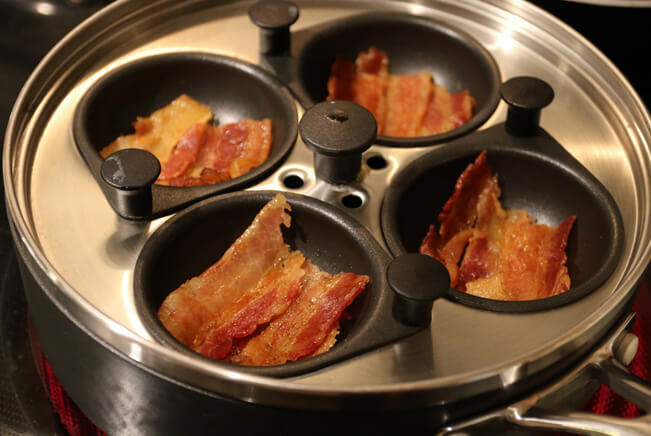 Press 3/4 – 1 slice of bacon in the bottom of each well. 7. Once the water underneath is streaming steadily, turn the heat down to medium. Fill each well with the egg mixture, covering the bacon at the bottom. Cover and cook for 5-7 minutes or until the centers do not jiggle. 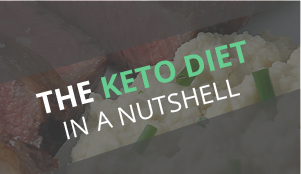 If you’re looking for a slightly less caloric version, this will be your go-to. You can skip out on cooking the bell pepper yourself on this one as well. If you just want something convenient and fast, go ahead and grab some from the store. 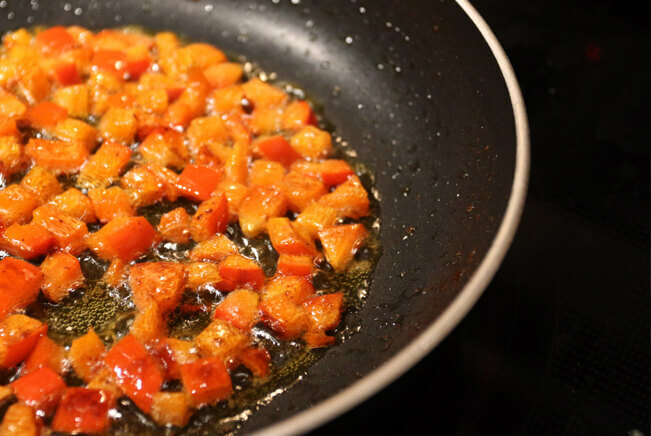 There’s no point in spending 15-20 minutes roasting a pepper yourself, so I prefer to saute. Feel free to switch out the red bell pepper and spinach for your favorite vegetables. Roasted cauliflower and spring onion is a combo that sounds awesome! 1. 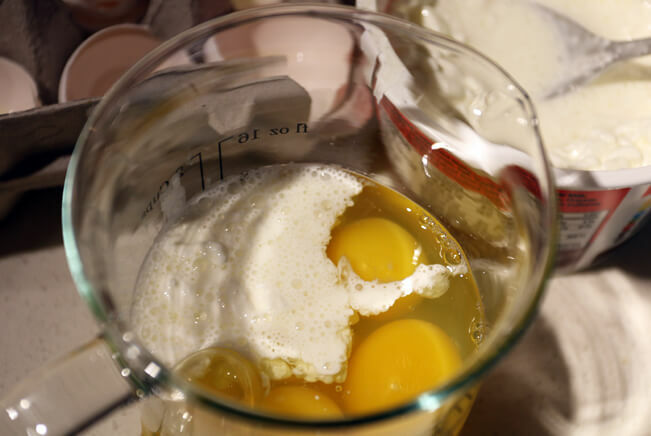 Crack 6 eggs into a container, then add ¼ cup cottage cheese to your eggs. Make sure this is full fat cottage cheese (preferably an organic source). 2. Dice the red pepper and spinach and set aside. Make sure to give a small, consistent chop to each piece. 3. 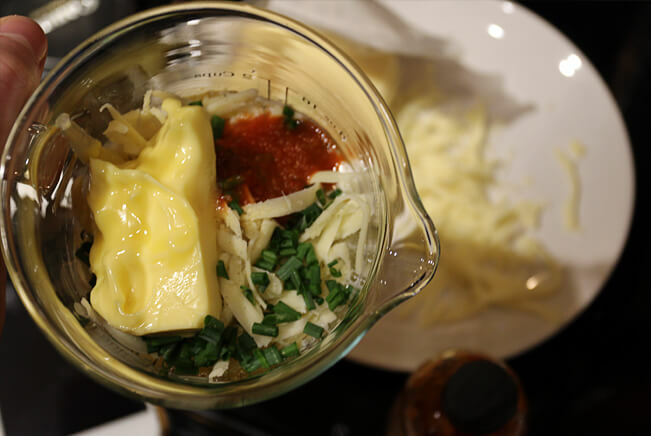 Grate the Parmesan and Monterey Jack cheese and then add into the mixture. At this stage add salt, pepper, and your favorite seasonings. I tend to keep it light with the seasoning (a bit of garlic powder and herbs). 4. Blend until smooth. I choose to use an immersion blender for this, but you can use a blender. 5. Heat butter in a pan on high heat. Once hot and bubbling, add red peppers. Cook until browned on the outside. 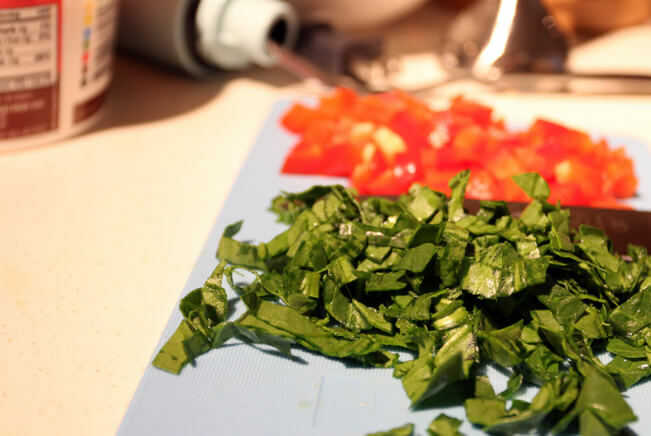 Note: You can optionally saute the spinach as well for a few minutes. This will give a closer aesthetic to the inspiration as raw spinach tends to float atop the egg bites. 6. 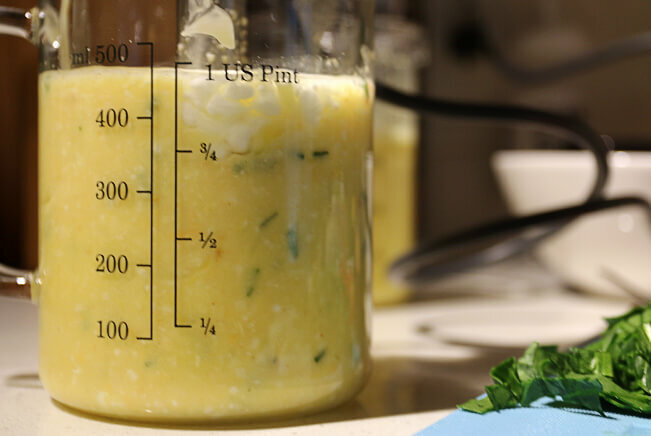 Once finished, add spinach and red pepper to the blended egg mixture. Stir well to combine. 7. Add water to the bottom of your poaching pan. Then, turn to medium-high heat. Once the water underneath is streaming steadily, turn heat down to medium. 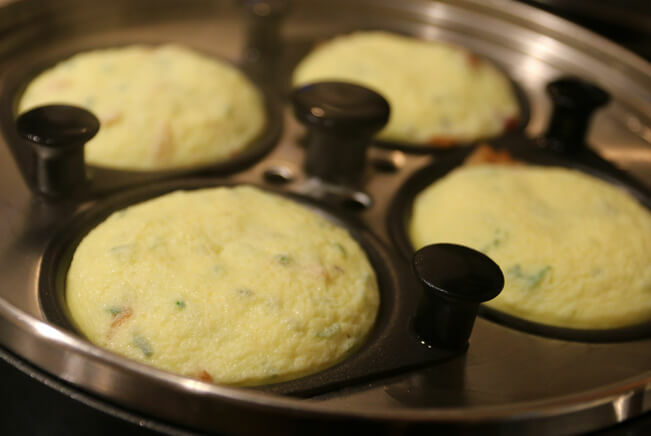 Fill each well with the egg mixture, cover and cook for 5-7 minutes or until the centers do not jiggle. 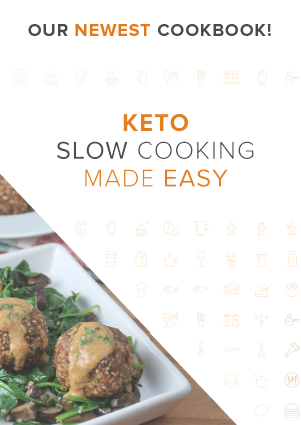 Makes 16 (8 per flavor) Keto Faux Sous Vide Egg Bites. They’re a perfect grab-and-go breakfast and can even be made in advanced! 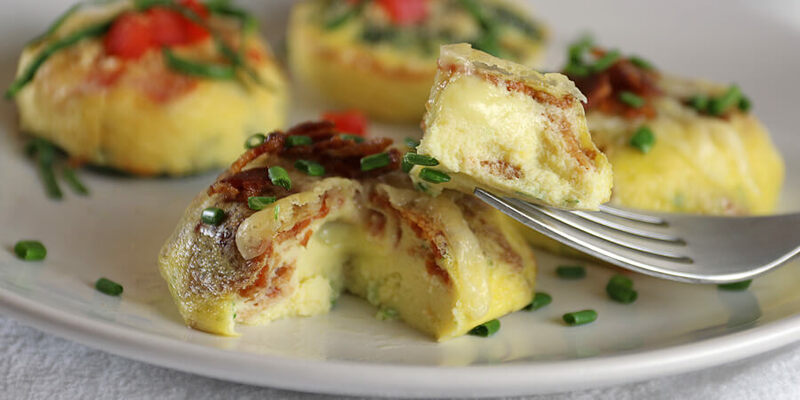 Each Bacon & Gruyere Egg Bite comes out to be: 140.63 Calories, 11.05g Fats,0.65g Net Carbs, and 9.19g Protein. 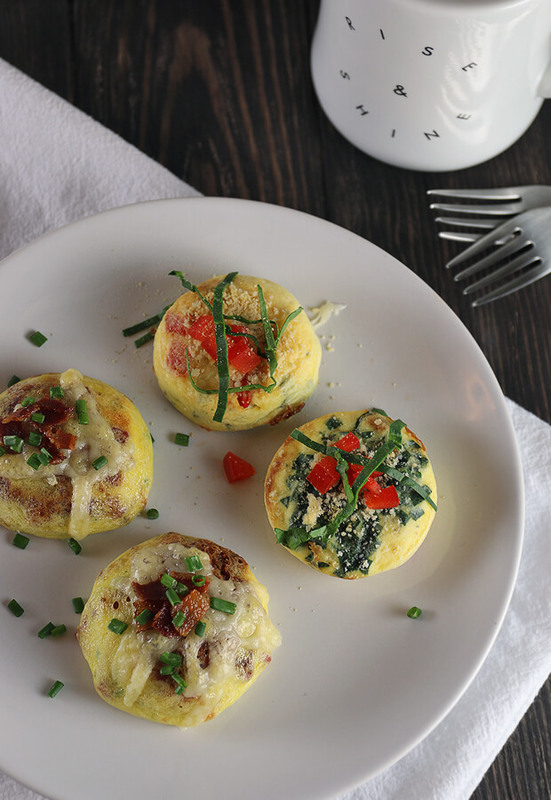 Each Red Pepper & Spinach Egg Bite comes out to be: 93.13 Calories, 6.75g Fats, 0.86g Net Carbs, and 6.79g Protein. 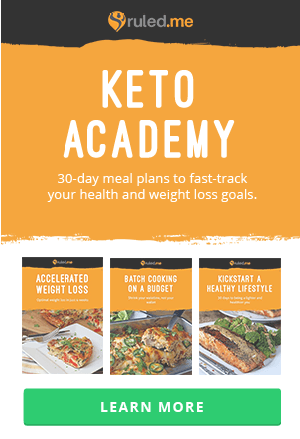 Makes 16 (8 per flavor) Keto Faux Sous Vide Egg Bites. They're a perfect grab-and-go breakfast and can even be made in advanced! If you're making bacon, go ahead and put that in the oven now. Otherwise, skip this step by purchasing pre-cooked bacon. 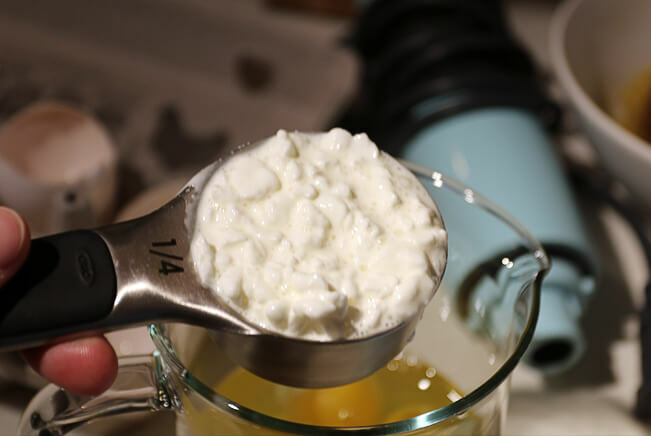 Crack 6 eggs into a container, then add 1/4 cup cottage cheese to your eggs. 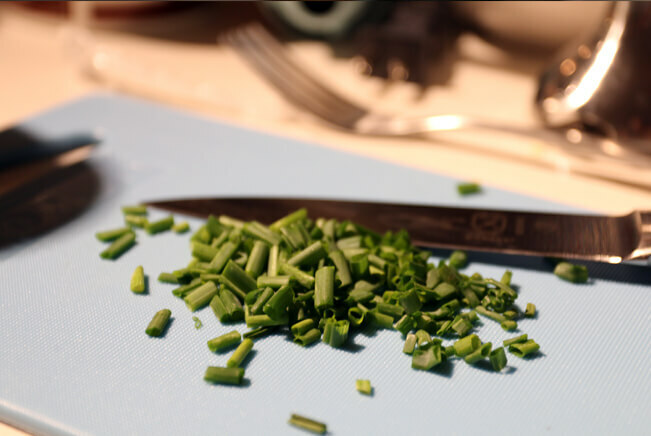 Chop the chives into small pieces. Set aside. 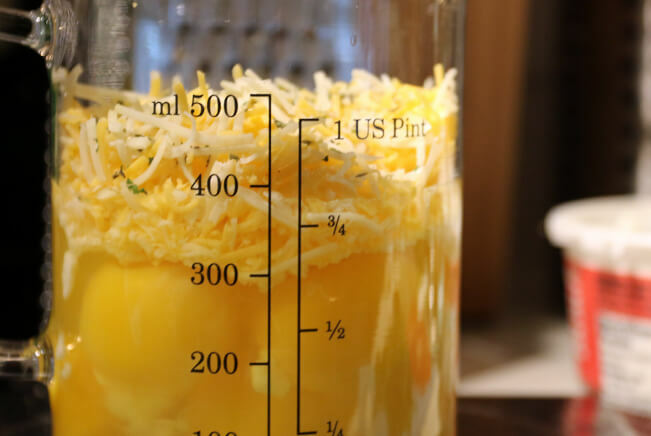 Grate the cheeses and add into the mixture. Add seasoning, chives, hot sauce, and butter. Blend smooth. Add water to the bottom of your poaching pan. Then, turn to medium-high heat. Press 3/4 - 1 slice of bacon in the bottom of each well. Once the water underneath is streaming steadily, turn heat down to medium. Fill each well with the egg mixture, covering the bacon at the bottom. Cover and cook for 5-7 minutes or until the centers do not jiggle. Dice the red pepper and spinach and set aside. Grate the cheeses and add into the mixture. Add seasoning and blend smooth. Heat butter in a pan on high heat. Once hot and bubbling, add red peppers. Cook until browned on the outside. You can skip this step by purchasing pre-roasted red peppers. 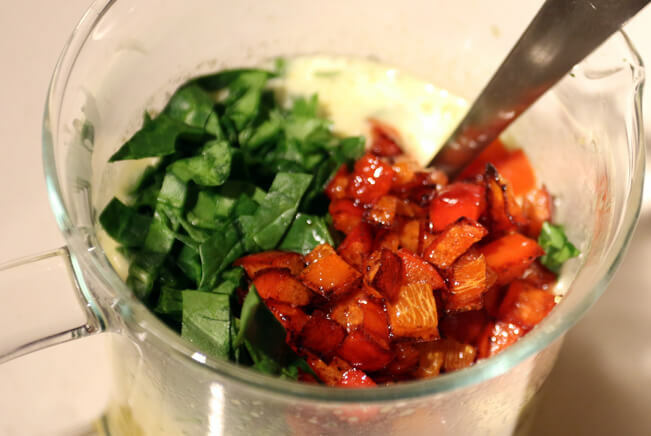 Add spinach and red pepper to the blended egg mixture. Stir well to combine. Add water to the bottom of your poaching pan. Then, turn to medium-high heat. Once the water underneath is streaming steadily, turn heat down to medium. Fill each well with the egg mixture, cover and cook for 5-7 minutes or until the centers do not jiggle.